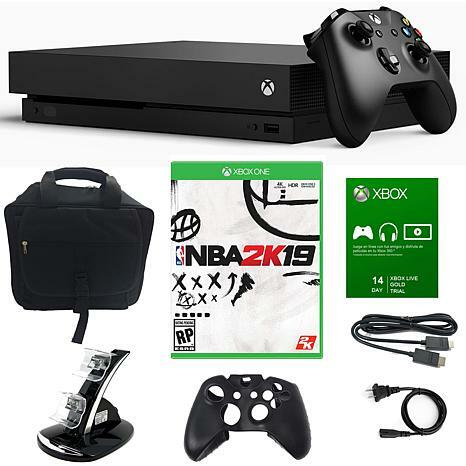 Own The Xbox One X 1TB NBA 2K19 Bundle and dive into the very best of Xbox One. Get instant access to over 100 great games with 14 day live trial. Watch 4K Blu-ray movies and stream 4K video on Netflix, Amazon, hulu and experience richer, more luminous colors in games and video with high dynamic range Technology. Xbox One has over 1,300 great games including today's blockbusters, 200 console exclusives, and 400 Xbox classics. Xbox One is the only Console where you can play new EA games for a limited time before they're released with EA Access. NBA 2K celebrates 20 years of redefining what sports gaming can be, from best in class graphics & gameplay to groundbreaking game modes and an immersive open-world "Neighborhood."